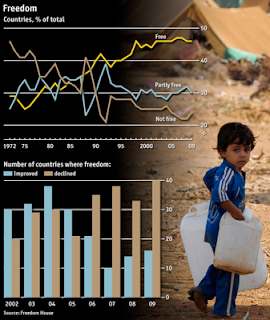 In 2009, declines for freedom were registered in 40 countries, representing 20 percent of the world’s polities. In 22 of those countries, the problems were significant enough to merit downgrades in the numerical ratings for political rights or civil liberties. Six countries moved downward in their overall status designation, either from Free to Partly Free or from Partly Free to Not Free. The year also featured a drop in the number of electoral democracies from 119 to 116, the lowest figure since 1995. So much for the 'end of history' (image via The Economist twitter feed). Still, it is gratifying that despite the economic shock we have experienced in Ireland we are still amongst the freest countries, in terms both of political rights and of civil liberties. And to add some icing to the cake, we learn today that Ireland ranks 5th in The Index of Economic Freedom World Rankings. Curiously, 7 of the top 10 nations in the world rankings are former British colonies ... though the UK itself has fallen to a lowly 11th position. It isn't doing great on the civil liberties front either come to think of it. Those who expect to reap the benefits of freedom, must, like men, undergo the fatigue of supporting it. I came to see soldiers as men willing to lay down their lives for the sake of others. They fight for themselves and the generation under immediate attack, but certainly they fight for the futures of free peoples. Decades beyond World War II, I am one who benefited. That I can vote in presidential elections and not bend my knee to Hirohito’s grandson is testament to the enduring work of veterans. That I can write books for a living instead of sweating in a Third Reich factory is a product of Allied triumph. And, I might add, the freedom to write blog posts celebrating our freedom. May I never take it for granted.